France hasn't hit its full stride at the World Cup yet, but it still rested a number of stars in a listless draw vs. Denmark, keeping an eye on the bigger picture and a first World Cup title in 20 years. MOSCOW — The most meaningful moment of Tuesday’s World Cup Group C finale between France and Denmark here at the Luzhniki Stadium occurred in around the 18th minute, 1,000 miles to the south in Sochi. There, Peru took a lead over desperate but underwhelming Australia, essentially confirming that the Danes would advance to the round of 16 along with Les Bleus. With the stakes all but resolved, the two European sides played (in a manner of speaking) to avoid injury, suspension or sweat stains as they lurched to this World Cup’s first 0-0 draw. They fulfilled their scheduled obligation under cascades of whistles and boos, but neither was concerned. In fact, both coaches expressed post-game satisfaction. Denmark, which is here to get out of the group then roll the dice in the second round, was content with second place. As for France—it’ll be far more interested on the July 15 game at Luzhniki than Tuesday’s. Les Bleus are in Russia to win the World Cup. The thing is, that’s been the case at a lot of World Cups. Yet France has just the one title—earned on home soil in 1998—to its credit. Obviously, all but eight countries would be thrilled to make that statement. 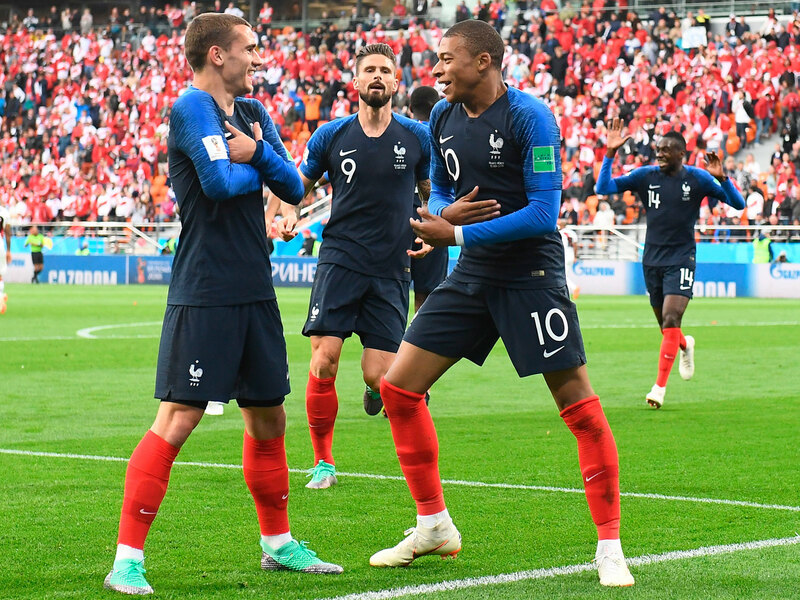 But somehow, considering what seems to be an endless stream of world-class talent at their disposal, Les Bleus have frequently stumbled on the big stage. The stories of France’s near misses, implosions, bad luck and self-inflicted wounds are as legendary, and more plentiful, than the memories of its triumph two decades ago in Saint-Denis. It seems as likely to go home early, or in disgrace, as it is to stay until the end. A glance at the players left behind this summer by coach Didier Deschamps is an indication of the quality of those in Russia: Lacazette, Martial, Coman, Sissoko, Koscielny, Digne, Sakho, Benzema, Payet—France’s ‘B’ team might have a shot at the World Cup quarterfinals. Such is the wellspring of talent produced at Clairefontaine and in the Paris banlieues that Deschamps named just nine Euro 2016 silver medalists to his World Cup squad, and there are only six players remaining from France’s run to the last eight in 2014. On Tuesday, with a first-place finish likely and only three full days of rest before an expected round-of-16 game in Kazan, Deschamps displayed the measure of his resources. The likes of Paul Pogba, Kylian Mbappé, Blaise Matuidi, Samuel Umtiti, Benjamin Mendy and Hugo Lloris all started on the bench. Some were on a yellow card, others were rested or recovering. Yet still, Denmark adopted a withdrawn, defensive posture. France controlled possession (62% to 38%) and more than doubled Denmark’s shot total. But against a well-organized opponent and absent any urgency, Les Bleus didn’t really press the issue. There were missed connections, stray passes and a dearth of clear looks at goal. Substitute Nabil Fekir came closest to breaking the deadlock in the second half, and goalkeeper Steve Mandanda did well to take a dangerous cross off Denmark star Christian Eriksen’s foot in the 29th minute. And so the group concluded anticlimactically, with France’s title credentials remaining obvious on paper, but still not established on the field. Les Bleus finished first-round play 2-0-1, with just three goals scored and one yielded. They hardly blew the doors off a quartet in which they clearly were the most talented squad. Deschamps said Tuesday evening that the 2-1 defeat of Australia was “not quite good enough” and that the subsequent 1-0 win over Peru was “better,” even though La Blanquirroja had their share of chances. Most of this tournament’s favored teams have started slowly, he said. France’s goal now must be to avoid making it more complicated than it has to be. In the past, that’s been one of its specialties. There was the 2010 mutiny against coach Raymond Domenech sparked by the team’s dismissal of Nicolas Anelka. That followed the Zinedine Zidane headbutt in 2006 that very well may have cost France a second star. In other years, Les Bleus simply and grossly underperformed. Their title defense in 2002 (a year in which they were World Cup, European Championship and Confederations Cup holders) was derailed by an astonishing loss to Senegal in the opener. Zidane was hurt that day in Seoul, but a squad featuring Lilian Thuram, Marcel Desailly, Patrick Vieira and Thierry Henry still managed to get beat by a debutant. In 1993, a team led by Eric Cantona, Jean-Pierre Papin and a handful of eventual champions failed to qualify after inexplicably blowing home games against Israel and Bulgaria. Michel Platini’s 1980s powerhouse fared better and came close, but lost two consecutive semifinals to West Germany. The trajectory looks good this summer. Deschamps’ group is relatively young, impressively deep and is getting closer to the summit, from the quarterfinal defeat by Germany in ’14 to the upset loss to Portugal in the Euro 2016 final. The question has been whether the manager can find the right formula—whether he can take all this individual ability and field a cohesive, all-conquering team. There remain several significant tactical questions, from the ideal number of forwards to the arrangement and responsibilities in a loaded and mobile midfield that features top players with overlapping abilities. Deploying Olivier Giroud as a target forward leads to one sort of approach. Putting Antoine Griezmann atop of a 4-3-3 produces quite another. And pundits and former players continue to chip away at the intangibles, looking for cracks in the foundation and wondering whether this generation of Frenchmen will succumb to the distractions or selfishness that bedeviled many predecessors. 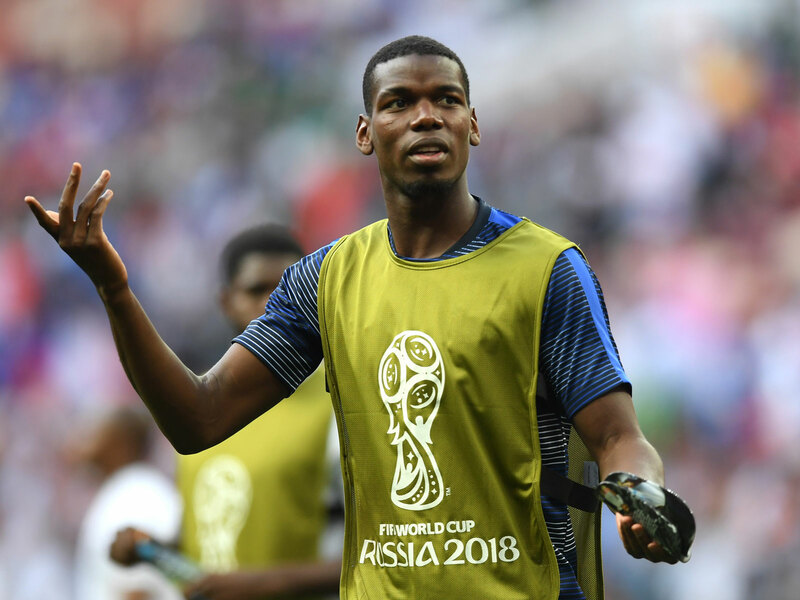 When Griezmann airs his “decision” special on the eve of the tournament, or whenever Pogba behaves oddly, commentary and questions flow that reveal fears of flaws and failures past. Hareide said here that his comments were taken out of context and after Tuesday’s draw and France’s first-place finish, he didn’t seem to think Les Bleus’ slower start was a sign of trouble to come. Champions grow into tournaments, Hareide said. “The big teams—Germany, Argentina, others–have had problems,” Hareide observed. “But France, I’m certain will come up there as a [contender] for the title. … The French team is getting better and better as you go forward. [It] will go into the last 16 and after that, the big games will start for France." Its "big games" actually begin in the round of 16 thanks to Argentina's last-gasp win over Nigeria later Tuesday. There haven't been many World Cup matches at that stage that have had the profile of France-Argentina. They meet Saturday in Kazan. Center back Raphaël Varane, who’s learned a thing or two about clutch performance collecting trophies with Real Madrid, said here that France’s potential remains front and center, rather than its uneven start or any possible problems. If he’s right, or prescient, then France has as good a shot as any team to be back at the Luzhniki for the biggest, most high-stakes game of all.